The new 4300 Open has earned its place as the linchpin of Tiara’s open fleet. The wind blew steady from the east and pushed some hefty rollers toward the coast. Meanwhile, the outgoing tide ripped through the narrow confines of the Fort Pierce inlet, meeting those swells head-on. The resulting mess could be described as a confused headsea or as a salty friend calls such conditions, “delamination time.” As we pointed the bow of the new Tiara 4300 Open toward the inlet, Dave Walsh, Tiara’s marketing manager, and Rick Eggerding, the director of product development, looked at each other and smiled. This is the kind of sea state that can make or break a boat’s reputation, so we had no choice but to throttle up and hold on. Consider the 4300 Open’s reputation made. We took water over the bow and shots from the side and had one drop into a deep trough. The cockpit cleared the water in no time, and I felt not a single shudder or rattle as we powered through the morass. The only part of the boat that didn’t fare well was the Tiara burgee on the bowrail, which came untethered and looked a little ragged after a time. Don’t consider that an omen as the 4300 Open ably replaces the old 4200 as the flagship model in the Tiara Open lineup. The new version adds a foot of LOA, five inches of beam, and a short ton (2,000 pounds) of weight. What remains the same is her sturdy construction. Tiara starts in the mold with a hand-laid skin coat of vinylester resin and cores the hull sides with balsa. The major components are prefabricated, single-piece, closed-molded parts. The deck is also closed-molded and balsa-cored while the stringers are cored with wood and foam and integrated into the hull structure. Add to that a sharp entry, generous bow flare, and reversed chines, and you have the reason for our shudder-free ride. When we came about and headed back through the inlet on a following sea, the 4300 Open never lost her tracking, thanks in part to 17.5 degrees of deadrise at the transom, on the higher side compared to similar boats (many in this range fall between 11.5 and 18 degrees). Her heavier build also helped. 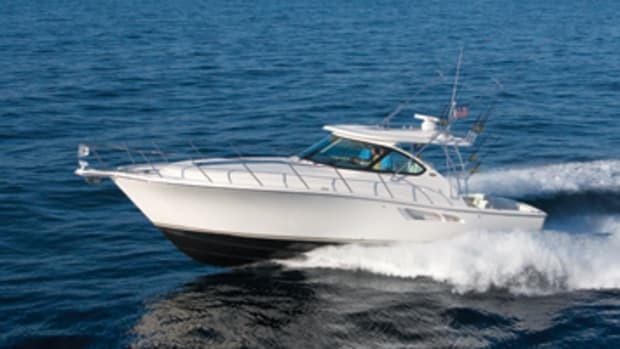 Whether you get this boat in the fishing or cruising version, you will appreciate her seakeeping. Sitting in the double-wide Stidd captain’s chair at the helm I felt more than comfortable operating the boat in the heavy offshore swell. I did note considerable bowrise while climbing onto plane, an observation supported by the trim numbers recorded during testing in calmer seas. But that was my only operational issue. The 4300 Open also remains true to her predecessor in terms of propulsion with straight-shaft inboard Cummins diesels. 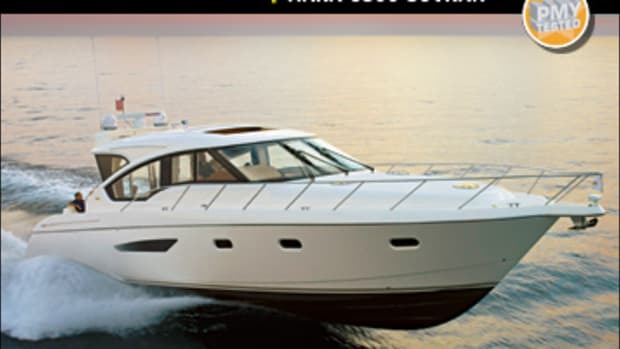 Tiara was one of the first builders to design boats specifically for IPS pod drives, and in the sportier 4300 Sovran, that system is de rigueur. “This is a more traditional, heavier boat,” says Walsh of the 4300 Open. 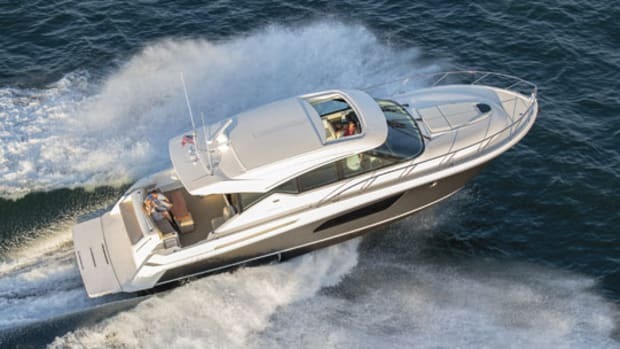 “We love IPS, but matching the propulsion for this hull takes us in the direction of the straight drive.” To heed the growing demands of the remote-control crowd, Tiara does offer a ZF joystick and bow thruster package as an option. 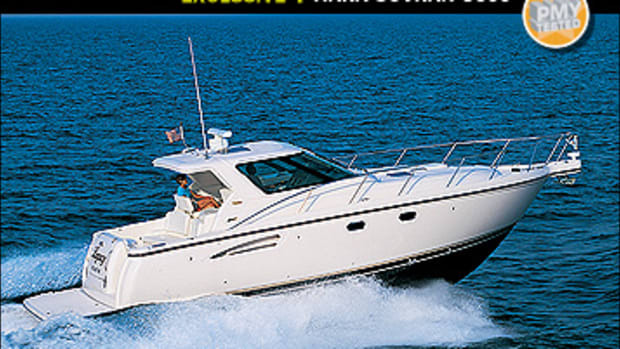 Our test boat also featured the Tournament Series option, meaning she was equipped to fish. She had the fishing hardtop, which is stout enough to support a custom tower and includes LED spreader lights, a teaser-reel compartment, four rod holders, and side enclosures for nasty days. 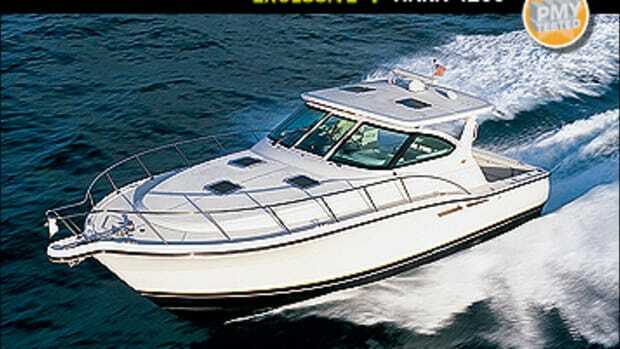 The cruising hardtop is thinner and sleeker and eschews the aluminum piping. (There’s also a no-top option.) 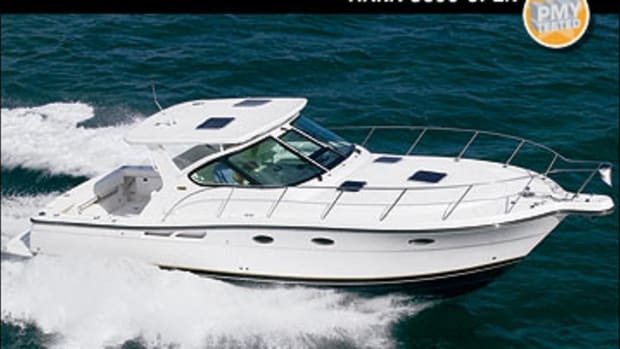 Both hardtops feature an improved helm-ventilation design, compared to the 4200 Open’s. 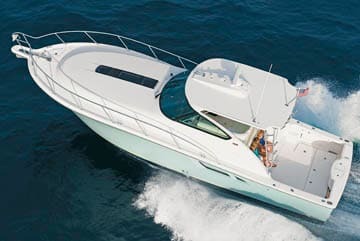 Instead of the old version’s powered vent in the windshield that blew air onto the helm and passenger, the 4300’s vents are integrated into the hardtop and flow air down from above. I enjoyed the fresh air in my face on this 80-degree afternoon, and when latched down, the vents proved watertight while running the inlet. Plus, the single windshield mullion, compared to two on the 4200, enhanced visibility at the helm. I relinquished the controls to Eggerding and enjoyed the view from the forward-facing, double-wide passenger seat on the helm deck. The seat rotates to a sideways position to complete the L-shape lounge on upper cockpit. It’s a nice feature that allows the passenger to see what’s in front underway, then turn the seat to enjoy a conversation with others at idle speeds or on the hook. To watch the fishing action, the best seat in the house is the aft-facing bench on the mezzanine. There’s an option for a bait-prep station with an ice maker for fishing or a wet bar and a drawer refrigerator for cruising. Stepping down into the cockpit, I took out a tape measure to record the dimensions: 95 square feet of open deck below the mezzanine. 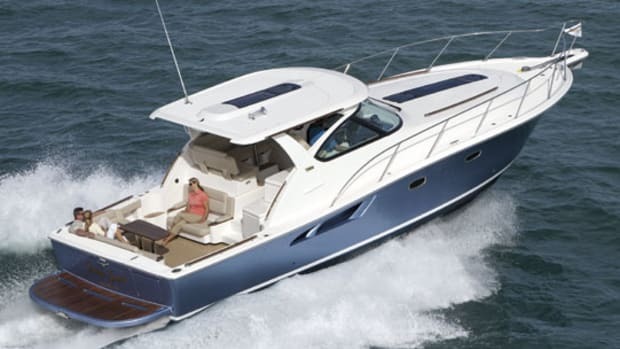 Anglers will appreciate the additional work space, up from 87 square feet on the 4200, as well as the straight transom, a change from the previous model’s reversed transom. Our test boat had almost every fishing feature on the options list, from the 50-gallon transom livewell to macerators in the spacious fishboxes to the gunwale rod holders. Tiara glasses an aluminum backing plate into the cockpit sole for mounting a fighting chair. 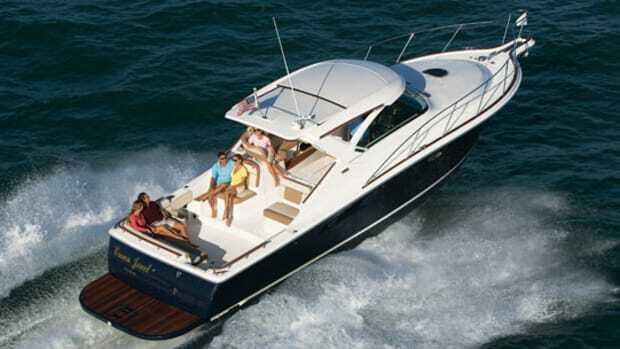 If you’re more inclined to cruise, you can opt for a different seating arrangement, like a fold-down transom bench or L-shape aft cockpit lounge. I didn’t go below decks until we made it back into calmer waters. Although I appreciated the teak interior and sole, Corian countertops, and dual refrigerators in the galley, what caught my attention was the additional stateroom. Where the 4200 Open had just the master forward of the saloon the 4300 also has a guest stateroom to port opposite the head with bunks. The saloon settee converts to a double berth and a pullman upping sleeping capacity to seven. What else did I like? 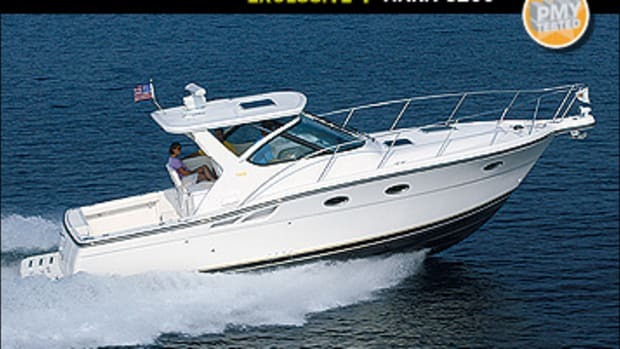 I noticed how, walking out to check out the windlass and the anchor pulpit, I always had a handhold, easily transitioning from the hardtop handles to the optional aluminum bowrail as I moved forward. The bowrail came up to mid-thigh, safer than the shorter cosmetic rails found on some boats that are just tall enough to trip over. That burgee had seen better days, but everything else onboard should keep Tiara’s excellent reputation as a builder intact.